PDS is obsessed with caring for your human capital management needs on a granular level. Whether you need an end-to-end recruiting, human resources, benefits, and payroll solution, or a full range of other HR services, we build technology for you to match your specific needs in a personalized manner. Our team of experts knows your name, so you get a truly personal experience your way, on your terms. What Can PDS Do for You? See our core solution suite in action. Get to know PDS and the people who work here. Explore our offerings including HR, Benefits, Payroll, Recruiting, and more. At PDS, we provide HCM solutions and technology that put you at the core of everything we do. Unlike cold and impersonal technology providers, we’re obsessed with the idea of people solving problems for people. We listen to you, we build technology to match your unique needs, and we tirelessly try to make things better. Our safe and secure HCM platform — whether cloud-based or on-premise — crushes even the most complex problems. PDS delivers HCM solutions across the entire employee life cycle with innovative technology that is personalized for user and business needs. Most important, our HCM solutions are backed by a team of experts who know your name. With PDS, it’s never just business because business is personal. We go to great lengths to care for our clients. We believe in intimate, one-on-one relationships between our service and our clientele. Our people are obsessed with solving your problems. Take a look at our award-winning software. Our complete software solution simplifies your business practices and processes. Build your own dashboards to easily streamline information into vital decision-making tools for strategic corporate success. 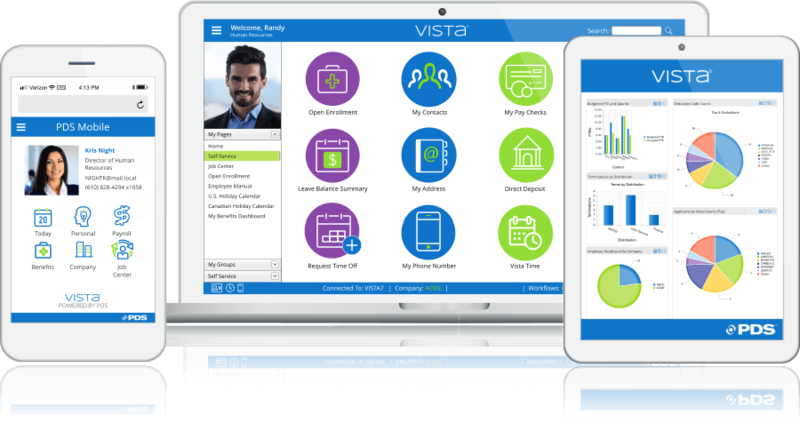 Our workflow engine is integrated throughout the Vista product, so any action can be automated through an approval process.